Klipsch Lou Reed X10i Signature Edition 'phones - worth the celebrity price tag? 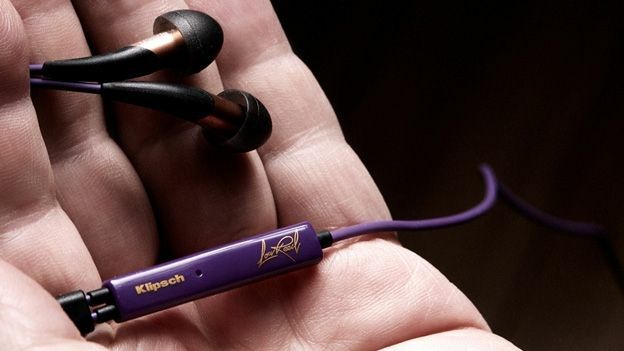 Klipsch promises a premium in-ear experience over rivals and the Lou Reed endorsement comes directly from the man himself but, really, are these updated X10is the last word in portable iPhone headphones? If you want a pair of small, lightweight in-ear headphones for your commute, they don't come much lighter. The streamlined earphones look great and while the 'Lou Reed purple' may not be to everyone's taste, it looks good with the gold inline controls. The solid carry case isn't small enough for a standard jacket pocket, but it is able to house the supplied airline plug adaptor and replacement buds. Overall, the space-age 'jellyfish' style of the earphones are striking and are all about audio quality in a small chamber, similar to the ultra small earphone technology used by Etymotic in-ear headphones..
At 10.5g, the Lou Reed X10i Signature Edition headphones are a joy to use, sitting in the ear easily. As always, you'll need to sort through the supplied earbuds to find a perfect fit but once you have, they offer best-in-class comfort. The cable is long enough not to sag and a tie clip on the cable means you'll avoid any cable snags while travelling. The earphones are sturdy and rugged and while the cable isn't flimsy, it doesn't boast the tangle-free woven design of the mid-range House of Marley headphone collection or rugged connectors of high-end rivals like the Etymotic ER4 MicroPro in-ear headphones. In order to protect them, you're going to need a small pouch for safe storage. A natural talent for neutral sound, great with acoustic tracks and superb skills for digging out detail in Apple Lossless tracks and exposing the failings of lower quality, 192 kbps iTunes files. The Lou Reed X10i Signature Edition headphones are audiophile headphones and the only downside is that they won't offer the same sonic excellence on noisy transport as noise isolation is poor but better buds go some way to solving the problem. For home listening or travelling in the quiet coach on a train, however, they're among the ultimate in-ear headphones for audio brilliance and deliver an impressive amount of bass without sacrificing overall detail. You'll need 320kbps or Lossless files and a quiet environment to get the most from them but, make no mistake, the Lou Reed X10i Signature Edition headphones are superb with all forms of music. The inline remote favours iPhone and it's worth noting that the new range of Sony Xperia phones won't work with these headphones at all but it's the £299 price tag that you'll need to think about, purely because the £199 Klipsch X10i headphones are identical in all but colour, carry case and a signed Lou Reed card. There's a £100 premium for the Lou Reed endorsement, in other words. The high price tag takes the Lou Reed X10i Signature Edition headphones beyond the £249 price tag of the highly competent Sennheiser IE80s too.